With the U.S. Senate passage of the “The Border Security, Economic Opportunity, and Immigration Modernization Act” (S.744) in the 113th Congress, it seemed like Congress was taking a long-awaited step forward in the arduous legislative trek toward passing a comprehensive immigration reform bill. While not a perfect bill, and certainly not the version that would have been written by civil rights advocates, the bill managed to garner the support of a rainbow coalition of labor, business, civil rights, advocacy, and faith groups looking to advance immigration reform through Congress. Almost a year after the passage of S.744, the U.S. House of Representatives adjourned the 113th Congress and failed to adopt the immigration legislation – killing any chance of enacting immigration reform. As a result of repeated instances of congressional inaction, President Obama announced a series of immigration-related administrative actions in November of 2014 to respond to the human consequences of delayed immigration reform. Similar to the support for S. 744, the president’s actions attracted a rainbow coalition of 16 organizations including Asian Americans Advancing Justice | AAJC, Define American, the Human Rights Campaign (HRC), the Labor Council for Latin American Advancement (LCLAA), the Leadership Conference on Civil and Human Rights, the League of United Latin American Citizens (LULAC), Mi Familia Vota, MomsRising, the NAACP, the NAACP Legal Defense and Educational Fund, the National Action Network, the National Coalition on Black Civic Participation (NCBCP), the National Urban League, National Council of La Raza (NCLR), Rock the Vote and Voto Latino. Even though they represented a variety of constituencies, all expressed their support for President Obama’s move to provide temporary relief to millions of immigrants, demonstrating the salience and insectionality of immigration issues. Even though months have passed since the President announced his administrative actions, our work continues. Strengthening cooperation among organizations working toward the advancement of the immigrant community is crucial to enacting comprehensive immigration reform legislation. While the media seemingly portrays the fight for immigration reform as a “Latino” issue centering on the voices of Latino advocates, immigrants, and civil rights leaders, the truth is that multiple communities are very much engaged in fighting for change. LGBT , African-American , Asian and Pacific Islander , union, business, and faith groups, among many others, have helped raise the issue of immigration reform as a key topic for their constituencies. These statistics underscore the importance of building cross-cultural and cross-community collaboration among groups representing Latinos and Asian Americans on the issue of immigration reform. We enter into dangerous territory when we refuse to acknowledge the diversity of the immigrant justice community and fail to recognize their stake in the battle. Extended family separations, lack of legal protections, and the constant fear of police apprehension affects Asian immigrants just as it does our own population. 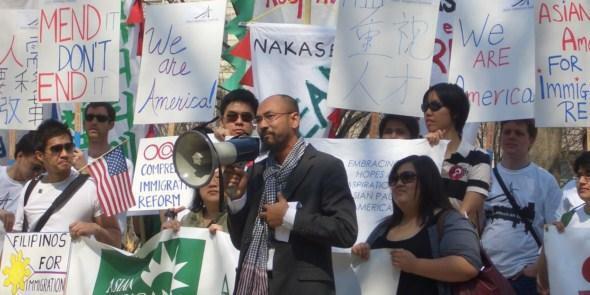 LULAC is proud to have partnered with groups like the National Korean American Service and Education Consortium (NAKASEC), the Organization of Chinese Americans (OCA), the National Council of Asian Pacific Americans (NCAPA), and the Southeast Asia Resource Action Center (SEARAC) that are working tirelessly to ensure that Asian voices are heard in the national dialogue on immigration. Through their efforts, more and more people are realizing the different faces of the immigration movement, and we enthusiastically applaud their work. As the Library of Congress notes, May is Asian Pacific American Heritage Month “a month to celebrate and pay tribute to the contributions generations of Asian and Pacific Islanders have made to American history, society and culture.” As the country highlights the many contributions of Asian Americans in our country, LULAC salutes the critical voices of our Asian American brothers and sisters in our shared struggle to fight for immigration reform. 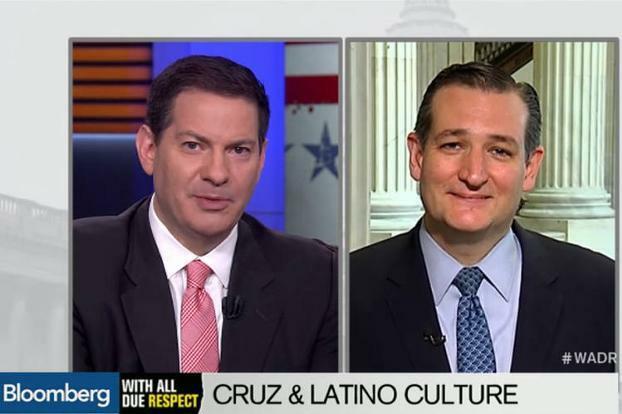 Are you "Latino" enough for Mark Halperin? On April 30, 2015, Journalist Mark Halperin, Bloomberg Politics, interviewed Texas Republican presidential candidate and Cuban American Ted Cruz. Halperin’s interview was so guised with racist undertones that ThinkProgress named it the “Most Racist Interview of a 2016 Candidate.” Syndicated journalist Ruben Navarrette compared watching the interview with “watching a college fraternity have fun with racial stereotypes.” The interview has received widespread criticism by individuals from both parties with many labeling it as bad journalism that crosses the line of what is acceptable from a national news anchor. What is the point of questions like these? What is Halperin trying to achieve by subjecting Ted Cruz to an identity litmus test? Simply put, he is asking Ted Cruz to prove his Cuban American identity by asking him insignificant questions and scoring his answers based on his own stereotypical assumptions of what it is to be Latino. What does this question try to accomplish besides trying to set a stereotypical standard on what it means to be Cuban/Latino/Hispanic or any other group? Aside from designating individuals as “different” and “other,” it also reveals the biases and prejudices that can easily make their way into journalism. Can you imagine how inappropriate it would be to ask President Obama a set of questions to determine how black he really is? Or Hillary Clinton how much of a woman she really is? How about a similar set of questions posed to a Jewish candidate? Or a gay candidate? These types of questions are predicated on the idea that there are answers that serve as evidence to a prototype Latino/Black/Gay/Jewish/Woman identity, even though the very idea of such a prototype existing is absurd. These types of assumptions result in bad questions that discredit the field of journalism. There is no standard Cuban, Latino, Black, Gay, Jewish, etc. individual. People in these communities are of diverse backgrounds, political affiliations, and exhibit a variety of tastes in music and food. Trying to standardize these identities homogenizes the rich experiences of individuals who comprise these groups. Halperin, in his interview with Ted Cruz, displays what minorities throughout the country have to go through every day in various social settings. Standardizing identities through trivial litmus tests contributes to the process of labeling individuals, reinforcing stereotypes, and dividing society based on these fabricated labels and stereotypes. Halperin attempted this with Ted Cruz by forcing him to prove his identity in a way that would require him to provide Halperin with stereotypical answers that would satisfy his own personal assumptions on what it meant to be Cuban American and Latino. Halperin fails to observe that identity is personal and that each person ascribes their own meaning to their identity. Unfortunately many minorities are not afforded the luxury of personal exploration, and are forced to confront, debate, and challenge socially ascribed expectations about what it means to be Latino, Black, Gay, etc. Aside from the Latino Litmus Test so poorly demonstrated in the Ted Cruz interview, many Latinos are subjected to an American Litmus Test every day. Many constantly feel pressured to prove how “American” they are; often going to great lengths to do so, from willingly changing the pronunciation of their names to refusing to speak Spanish in public. Historically, many Latinos experienced forced assimilation that often prohibited students from speaking in Spanish at school in an effort to “Americanize” them. I found Halperin’s interview and lack of respect for the Latino community particularly insulting, because like Ted Cruz, I also do not fit the stereotype that Mark Halperin has likely drawn up about Mexican-Americans. I am not fluent in Spanish and I like Blues-Rock. Does this make me “not Mexican enough” to represent Mexican Americans? I don’t have to wear a sombrero or wear a zarape and carry around maracas to satisfy someone's craving to put me in a box. Ted Cruz can be a Republican from Texas who listens to country music, runs for President of the United States, and still be as Cuban-American as they come. We should really care more about Ted Cruz’s policy stances than his ability to “prove” his Cuban American identity. Mark Halperin could have questioned Senator Cruz on how he will sell his immigration position to the Latino community considering that 86% of Latinos are in favor for a path to citizenship, or about his alternatives to the Affordable Care Act which has benefited millions of Latinos, although he continues to voice his opposition to both issues. For as much as we would like to know Ted Cruz’s favorite Cuban dish or his favorite Cuban singer, I would much rather like to know how his policies are going to impact my future. Click here to watch highlights from the Halperin and Ted Cruz interview. Francisco Castaneda is a Policy and Legislation Intern for the League of United Latin American Citizens. He is currently an undergraduate at the University of California, Los Angeles, where he is pursuing a Bachelor of Arts in Political Science, with a concentration in International Relations, and minoring in Public Policy. He is also currently attending the Center for American Politics and Public Policy Quarter in Washington Program where he is conducting his own original research on Black and Latino coalition politics in municipal settings.